Beat all the ingredients together in a mixer (except the jam). In a medium baking pan, spread greaseproof paper and pour half the mixture into the pan. Preheat the oven to 160oC and bake until lightly browned on both sides but still fluffy. 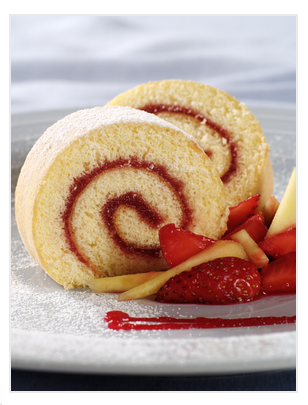 With a spatula, carefully remove the cake, spread the strawberry jam over it and roll it up. Repeat the process with the remaining mixture. Store both rolls wrapped in cellophane so they do not dry out.